Android Oreo 8.0 ROM, LineageOS 15 for Galaxy S6 has now arrived via an UNOFFICIAL build. This LineageOS 15 for Galaxy S6 (zerofltexx) is brought to you by developer lukasb06. THIS IS A BETA ROM AND MAY HAVE MANY BUGS. HAVE A BACKUP BEFORE FLASHING THIS LINEAGEOS ROM AND TRY AT YOUR OWN RISK. Installing a custom ROM on a Galaxy S6 (zerofltexx) requires the bootloader to be unlocked on the Galaxy S6 (zerofltexx) phone, which may VOID your warranty and may delete all your data. Before proceeding further you may consider backup all data on the phone. You are the only person doing changes to your phone and I cannot be held responsible for the mistakes done by you. – Here is theTWRP update guide for the Galaxy S6 (zerofltexx). Download and Copy the Lineage OS 15 GApps and LineageOS 15 for Galaxy S6 Oreo ROM ZIP file to your phone. First flash the Lineage OS 15 for Galaxy S6 Oreo ROM ZIP from device. Then flash the GApps for LineageOS 15 zip from your device memory. Reboot and Enjoy the Oreo 8.0 LineageOS 15 ROM for Galaxy S6. 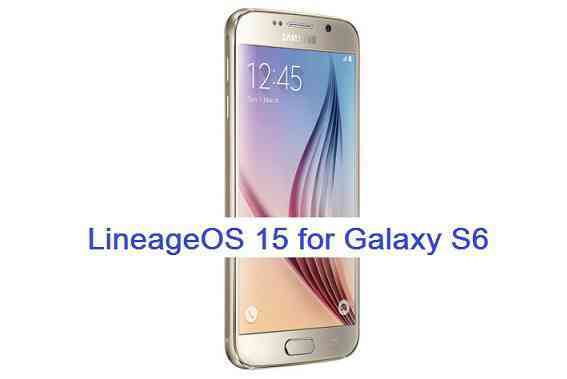 Copy the latest Galaxy S6 Lineage 15 ROM ZIP file to your phone. Stay tuned or Subscribe to the Galaxy S6 LineageOS forum For other Android Oreo, Nougat ROMs, LineageOS 15 ROMs, other ROMs and all other device specific topics. If you have found any BUG or any issues with this ROM, then following is the development thread at XDA created by lukasb06. all went okay till i am installing gapps i choosed gapps stock version now i see installation complete ! and a message to make google dialer as default but the progress bar down still moving but very slow and lagging a lot since more than 30 min …. then i tried another gapps based version it works good but google play and play services keep stoping and play store just stocking on checking information and nothing happening .